We have been deep in reviews this month on skincare. 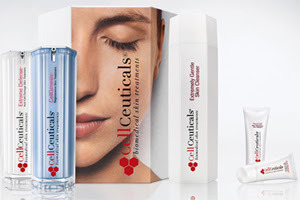 We wanted to remind you all that we have a 100 subscriber giveaway, where we are giving away an awesome CellCeuticals Skincare set. We were given the privilege to review this products as well, and you won't be disappointed. I'll be jealous of whomever of you lucky ladies (or gents) gets to give these products a new home. Jessica and I don't like to switch up our skin care regimen in a way that will make our skin react, so we each reviewed a few of the products. We were both impressed by this skin care regimen and were introduced to it by Beauty Army. If you want to try the products before buying them, I highly recommend signing up for the Beauty Army service. You can check them out here: www.beautyarmy.com or on Facebook at www.facebook.com/beautyarmy. The first thing I thought of when I read the description on this product was that it wasn't going to work on my skin type. Why? Every time I read a product label that claims to be gentle to skin, it is usually a lotion based cleanser (the kind they often tell you to tissue off) and leaves my skin very oily. I have normal/combination skin. My skin tends to be more on the normal to dry end, but I do tend to break out with pimples when I'm stressed, so I can't use oil based products. Anyhow, this stuff really surprised me. It felt GREAT on my skin and really got my skin clean. I love that it lathered wonderfully and really cleaned out my pores. As soon as I toweled off my face I thought, WOW why can't every cleanser leave my skin that refreshed? It is a clean, but not tight feeling. The product also claims on their website to have the ability to remove eye makeup. It's a habit of mine to remove my eye makeup before cleansing, but I do notice when I use this product, there are no remnants of eye makeup at all on my face. It truly does a great job of leaving my skin clean, hydrated, and supple. BIG thumbs up to this product! This container seems to be only slightly smaller than the cleanser, but is only 1 oz of product, rather than 6.7 oz. I'm guessing the plastic container contains only a small tube of product inside, which is a little disappointing and misleading. Although, these products are a 60 day supply, so you know it will last at least that long. This product contains a breakthrough GFP Cellular Complex that acts as a cellular stimulant to encourage the regeneration of new surface cells for visibly younger skin. In just two weeks, it claims your skin will look and feel firmer and remarkably radiant, with visible lines and wrinkles dramatically diminished. It is also for all ages and skin types. This has a gel like texture and feels cool and pleasant as it is applied on your face. There is a scent but it is light and non irritating. I find this can leave your skin feeling a little sticky after and kind of tight. As this skins into your skin the longer it is on, the sticky feeling seems to dissipate a bit. I guess the tighter feeling is kind of the point if you want to firm up your skin. I don't have a lot of wrinkles to begin with, so I couldn't really review whether this helped diminish the appearance of wrinkles. I did need some additional moisture after this product and so I used the Active Moisture + Barrier Treatment in addition. This is a powerful antioxidant treatment that works during the day to help defend skin against age-promoting free-radicals. It helps prevent cellular oxidative stress that may cause skin damage. It claims that when used along with the rest of the system, it will diminish visible wrinkles by 36%, decrease the appearance of the deepest wrinkle depth by 45%, refine skin texture by 31%, and reduce skin redness by 87%. I really enjoy the scent of this product. It is fresh, and smells like oranges, which luckily is a scent I like. If you don't like that smell, this product might bother you. I don't know if my skin was remarkably different, but I did notice my skin was brighter than normal, and I had less of those little lines under my eyes (you know- the ones your concealer always gets trapped in- yuck!) I am only 25 so I don't have deep wrinkles or lines yet, but I do have the beginning signs of aging. I really liked the smell, and I felt that it did make a difference in my skin. My skin is not normally red, so that was not an issue I felt this addressed. As with the other skin treatment, I felt that this one was about the same height as the cleanser (minus the cap) but a whole lot less product. Keep in mind, this is a 60 day supply, however, I really like my products to have as much product in them as they look like they do. I should note that I still used a toner before using this product, and a moisturizer after. The kit did not come with either but I did feel that I needed a little extra moisture. This product claims to be a deep penetrating moisture and barrier repair skin treatment that works between surface cells to soothe dry skin and provide long-lasting hydration. You can use this alone or in addition to the other products. This is a great product to add some much needed moisture to your skin. My skin tends to be on the dryer side and so I like to have this deluxe sized tube on hand for those extra dry winter days. This product uses natural enzymes and volcanic microminerals to gentle resurface skin without irritation, revealing smoother, more radiant, and healthier-looking skin. This has the feel of a very fine particle scrub. If you are not use to face scrubs or exfoliators, I would start out lightly with this product. Using water with this is a must. Apply a quarter size amount to a wet face and gently rub in circles on your face. I could see how this could feel a little harsh on your skin if you have sensitive skin.Your skin will feel much softer afterwards and this works great on dry patches of skin. Justina had the exact opposite thoughts on this and would've liked even more exfoliating action and thought this would be perfect for sensitive skin. It just goes to show you how skincare is really going to vary by person. The website claims that these products are perfect for all ages and skin types. While they worked well on us, I do think that's kind of a hard claim to stand by. I was impressed to see their website had some proof in pictures! While we enjoyed all their products, the real winner of the line for me was the cleanser! I highly recommend it! I hope to get a Clarisonic soon, and if I do this cleanser will be my go to for sure. I am really interested to see how such a thorough cleanser works with this deep cleaning brush. Stay tuned for more reviews! 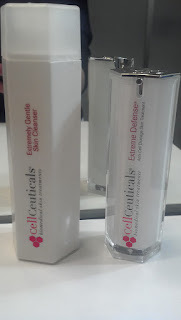 Thank you CellCeuticals for the opportunity to try your products, and for sending us products to giveaway to our fans. We look forward to reaching 100 subscribers so we can give away this awesome skincare set. Please note that while we were given these products at no cost to ourselves, our opinion is honest. We strive to bring you the best and most honest in beauty reviews! This is a really great review. Very thorough and useful! Thanks!